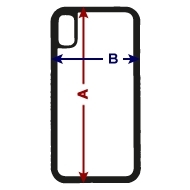 iPhone X/XS Case is in stock. We will print it as soon as you order it. This form-fitting rubber cover for the iPhone X/XS is a great way to add a little personality to your new phone. Sleek and lightweight, this protective case helps you avoid scratches, scuffs, chips and cracks, and it can act as a buffer should you accidentally drop your phone. All designs/images should be uploaded at 400 dpi.